The Pico Union district of Los Angeles has the largest Salvadoran community outside of El Salvador. Several years ago my wife, two kids and I spent a summer living and working in Pico Union as part of a student leadership project. Inside a neighborhood restaurant, I came across this mural. 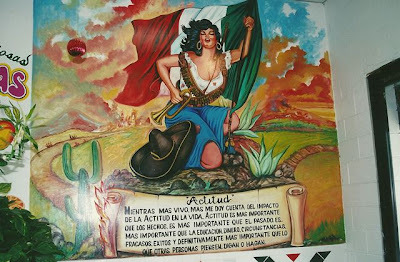 In the mix of cultures that is often found in Los Angeles, while the restaurant was Salvadoran, the theme and look of the mural was definitely Mexican. Working on the quote at the bottom, I kept thinking to myself "I know I've read this somewhere before." I finally realized it's the "attitude" quote from Christian author and pastor Chuck Swindoll. Attitude, to me, is more important than facts. It is more important than the past, than education, than money, than circumstances, than failures, than successes, than what other people think or say or do. It is more important than appearance, giftedness or skill. It will make or break a company... a church... a home. The remarkable thing is we have a choice every day regarding the attitude we will embrace for that day. We cannot change our past... we cannot change the fact that people will act in a certain way. We cannot change the inevitable. The only thing we can do is play on the one string we have, and that is our attitude... I am convinced that life is 10% what happens to me and 90% how I react to it. And so it is with you... we are in charge of our attitudes. Here's a link to some additional information and photos on Pico Union, located north of USC and directly west of downtown. I remember reading this paragraph about attitude several years (more lileky a couple decades) ago. I think it's time to pass it on to my students.